Buffalo is most popular slot machine ever made. Although the original game was first produced in 2008, it's amazing to think that this classic version is still in every casino across the US. There are also lots of amazing new versions to play, including Buffalo Gold Buffalo Stampede, Buffalo Grand and the brand new Diamond edition. 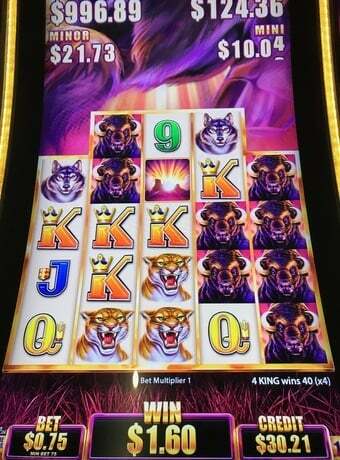 If ever there was a genuine legend in the slot machine world, it has to be Buffalo. This game has been the most popular slot in Vegas for so many years now, it's incredible. Buffalo eclipses other hugely famous slots like Cleopatra and Wheel of Fortune, in terms of the number of machines in the casinos and the number of people playing them. The popularity of Buffalo isn't limited to Vegas, it is massive in casinos all over the US as well as in Canada and Australia. The game is also starting to break into Europe, where Aristocrat games have historically never been particularly prevalent. It is very easy to find Buffalo slots in every casino in Las Vegas and some casinos have huge areas dedicated to just this one game. One of the best places to play this game is Harrah's, where they have a big area in the middle of the slot floor which has mostly Buffalo. How Many Versions of Buffalo Slots are There? After the original, the next version made was the 'deluxe' version. In that game, the basic play was the same as the first one, but you could choose the multipliers of the Buffalo icons in the bonus game. If you pick a higher multiplier (up to 5x), then you get fewer free spins, but if you pick a lower multiplier (up to 3x), then you get more free spins. After the Deluxe version, the next really big version (there were a few minor updates in the meantime) was the Stampede game. This is the one with the elongated screen, where the Buffaloes run up the screen. This game still feels like it is quite new, although it can look a little dated in some casinos, is the screens have started to fade. 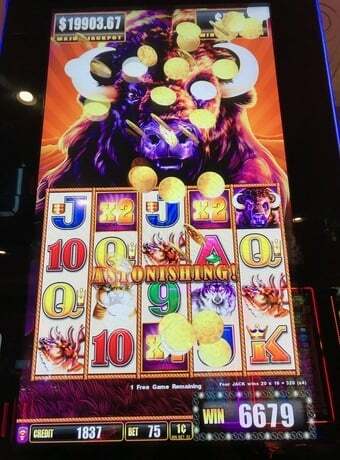 Following the Stampede version, came the Buffalo Gold and Buffalo Grand games (they came out quite closely to each other), with their huge screens, amazing sound and a lot of innovative new features like spinning wheels (Wheel of Fortune type thing) and new bonus games. Taking a look around the Vegas casinos, whichever type of casino you go to (big or small, Strip, Downtown, or off Strip) the most popular of the 'newer' versions seems to be Buffalo Gold. In some casinos there are literally dozens of them on the slot floor! Buffalo Gold is particularly attractive because you can win a huge amount on the bonus game, even if you only play 40 cents per spin. 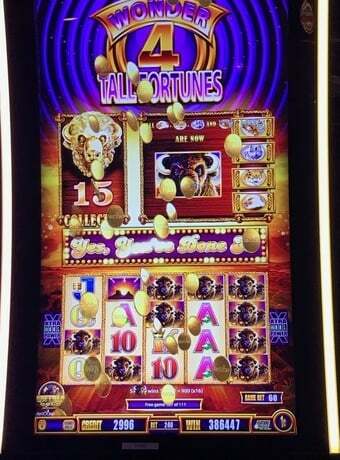 It has been known for players to win over $4,000 in the bonus round on Buffalo Gold. To do that, you will need to hit all the 15 golden Buffalos during the free spins and then keep re-triggering the game after that. Online, the only version available is the classic game, albeit an updated one with nice shiny graphics. The mathematics of the free online version (and the real money one, if you happen to live in a country where it is available) is identical to the original Vegas one. Afer the deluxe version was released, the next version to come out was the Buffalo Stampede game. Buffalo Stampede looks very different at first sight, but the game play has kept all the appeal of the original, so it is still great fun. Possibly, it is even better than the original, although it is more expensive to play - 70c per spin minimum! So, if you play this game on a lower stake, then you will have to put up with a lower payout rate and so you would be likely to lose your cash a bit more quickly, on average. On the other hand, the game has amazing graphics and actually gives players a chance to win really big in normal play and not just the bonus. There is also a new, but old-fshioned style of game, with 3 reels. This one is very much like the original Wheel of Fortune game in style and appears to be more of a limit game, than a penny slots. Like many 3-reel games, the three-reel Buffalo slots is one you really need to play max bet per line ($3 per spin, or more) to get any type of value from your play. There is also a massive version of the original in many casinos. This one is so big it's actually hard to focus on the game when you play. It also features a love-seat for two people, so it's a great one for couples and lovers to enjoy. In addition, a game called Buffalo Max - this game rewards you for betting more and does not appear to be very popular. Possibly, players have rejected it because it feels like you are being punished, if you just want to play for 40 cents per spin, instead of 400 cents. Most recently, Aristocrat has launched a 'Diamond' version, which features a 4k screen, to celebrate 10 years of the game. Although the game was launched in 2018, to celebrate the decade since it was released in 2008, most casinos will not see it on their slot floor until 2019. The Buffalo Diamond game has an unusual 'honeycomb' style format to the reels and is bound to be another big hit. Whether it stands the test of time, like the original and many of the latest versions, remains to be seen. Only time will tell. To play Buffalo slots for real money online, you will need to be in a country where Aristocrat games are available in online casinos. This includes the UK and some other European countries, but does not include the US, Canada, or Australia, Unfortunately. That said, there are quite a few 'copies' or close 'emulations' of the game available (unofficial versions) in several online casinos. To find these games, please visit our real money slots page, where you can find the best casino to play. The same terminology is also used in New Zealand casinos. and you will find the same games in New Zealand as you find in Australia. Buffalo online pokies is definitely one of the most popular games out there and you will be sure to see this one along with other Aristocrat classics, like Zorro, Big Ben, Wild Panda, More Hearts, More Chili, Wicked Winnings and Where's the Gold. In Canadian casinos, the Buffalo slot game is as much loved as it is in the USA, including Las Vegas, Reno and Atlantic City. What you will find though, is that the payout table might be much different. For some reason, the payouts on Buffalo vary from place to place. I have no idea why, but I do know that my favorite is the one in Las Vegas. If you would like to play games online that are similar to the Buffalo slot machine - that is, with the same mathematics (the 243 winning lines) and with similar free spin bonus games, then the best game to play would be Jaguar Mist. It is essentially the same game as Buffalo, but with a different theme. Jaguar Mist used to be available online, but it got taken down in 2018, so you have to go to a bricks and mortar (land-based) casino to play now.